We talk to Steve Catsos about his ability to work with trees. 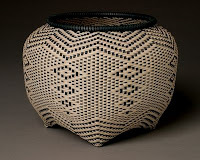 He takes a standing black ash tree and preps it so his wife, Joann, can weave award winning baskets. He considers it a craft rather than an art. After a visit with the farm animals, we grill freshly picked vegetables and eat. His daughter, Jenna, then shows us how to make felt. She considers her art crafts. I’m starting to see a trend here.